Rowland Langmaid (1897-1956). Etching. Signed. Standard size: 8.25 x 6.89 ins (21 x 17.5 cms approx) (but available in sizes as required). Executed from a spot ashore at Fort Blockhouse on the Gosport side of the entrance to Portsmouth Harbour this is a view well known to past RN submariners who knew the wardroom terrace at HMS DOLPHIN. 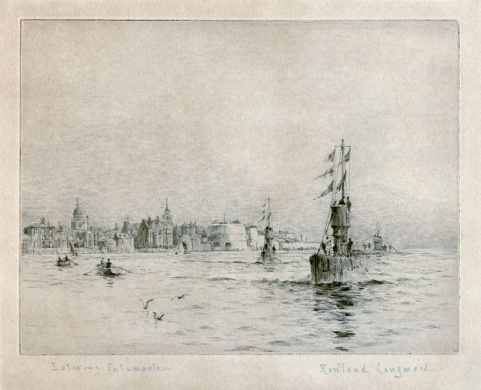 We are looking across to Old Portsmouth with the Round Tower at centre (just to the left of the second submarine) and the house of Langmaid’s mentor, WL Wyllie - Tower House - just to the left of Round Tower. Wyllie had built the tower and spire just after the Great War to enable him to see the incoming ships over the top of Round Tower! What would appear to be three H Class submarines are entering the harbour with the focsle hands laying out the berthing lines on the casing before they turn to port around Ballast buoy and berth alongside on the trots at DOLPHIN. Joining the fleet between January 1918 and March 1920 the 21 boats of this class would have been new at about the period that Langmaid is known to have been especially busy with commissions in the Portsmouth Dockyard area, the early 1920s, when he had recently retired from the RN and was now making a full time living as an artist.